The Perseid is the most gifted Meteor Shower of the year for the Northern Hemisphere. 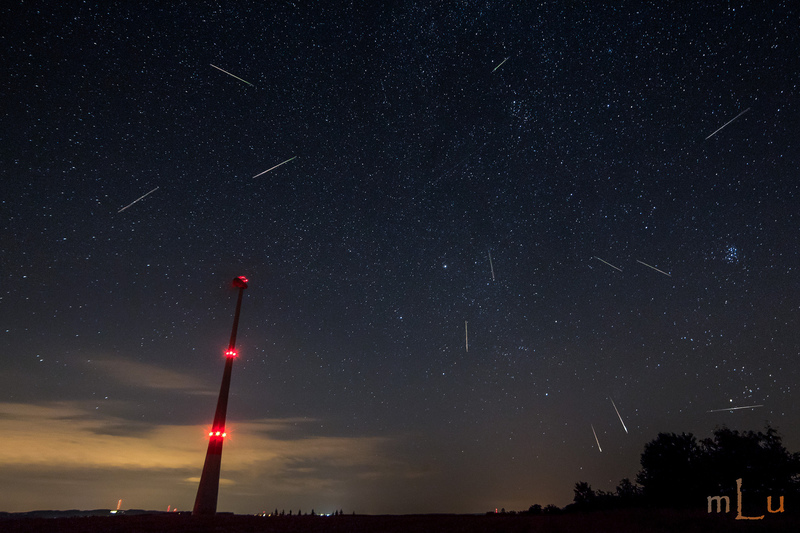 The Perseid offers a consistently high rate of meteors every year (up to 100 meteors per hour) and it occurs in August when the temperatures are usually nice enough for a night under the stars! Every year, the dust particles from the tail of the Swift-Tuttle comet pass the Earth orbit and burn in our atmosphere (about 70 miles / 110km above us) from mid-July to the end of August. The meteors are in fact glowing columns of air resulting from the burn of these particles. When the dust and ice hits our atmosphere at around 37 miles / second (59km/s) they disintegrate high up in the atmosphere after making a brilliant flash of light. Most of these particles are the size of sand grains, while a few are as big as peas. They can streak across the sky in a flash, or persist for several seconds before vanishing. Meteor Showers peak, or reach maximum, at the same time each year. 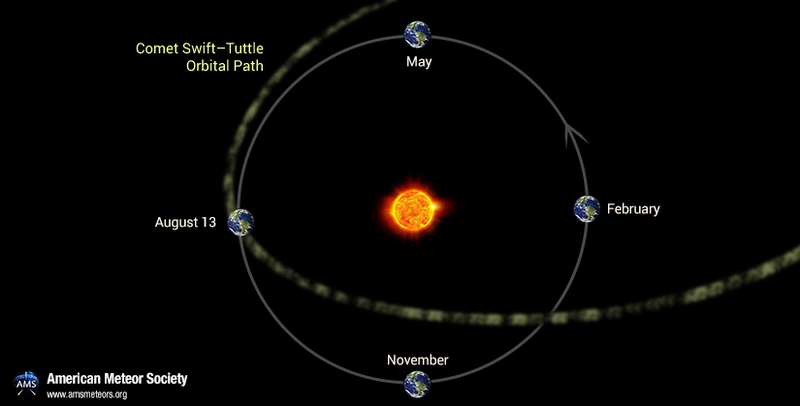 Earth encounters debris from Comet Swift–Tuttle every year at the same period. Meteor Showers are named for the constellation out of which they seem to come. Because all of the particles are moving in roughly the same direction, the meteors which strike our atmosphere all “point” back to the direction of the comet’s path. This point in the sky is called the Meteor Shower Radiant. The Perseids appear to come from a point next to the constellation of Perseus. Perseids can be seen anywhere in the sky, but the direction of motion, when traced back, will point to a point next to the Perseus constellation. 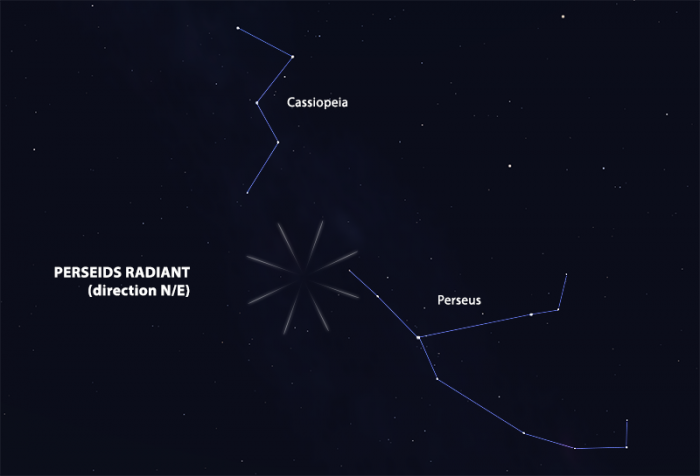 The radiant point for the Perseid meteor shower is in the constellation Perseus (North East, after midnight). But you don’t have to find a shower’s radiant point to see meteors. Instead, the meteors will be flying in all parts of the sky! Pick a nice spot away from light pollution. We prefer isolated locations (beaches, mountains, parks, etc.). Try to avoid distraction like music, and don’t forget to switch off your cell phone! The most important: try to turn away from the moon and any source of light pollution. The darker the skies are, the easier it will be to see meteors. This year, the waning crescent moon rises shortly before sunrise will not obtrude the show so you can watch pretty much every direction. Look about two-thirds away up to the sky to avoid light pollution over the horizon. It’s also the most comfortable to lie in a lawn chair so your neck does not become strained. If the ground is dry lying on a blanket is another option. During the best hour for observing the Perseids this year, you’ll have to look North/East to find the Perseus constellation. It may be easier to find Cassiopeia first (the constellation that looks like a “W”): Perseus is right next to it. Again, you don’t need to watch the Meteor Shower Radiant to see meteors; it’s just a good landmark for your observation session. As Earth rotates, the side facing the direction of its orbit around the Sun tends to scoop up more space debris. This part of the sky is directly overhead at dawn. For this reason, the Perseids are usually best viewed in the predawn hours. The 2015 Perseid meteor shower will probably feature a good show on in the predawn hours of August 11, 12, 13 and 14, with the nod going to the morning of August 13. We’re running an crowd-sourced program to measure the spatial distribution of Perseids. Anybody with an Android smartphone can participate. You simply download the app at https://play.google.com/store/apps/details?id=com.codysseus.meteorcounter. It has all the instructions you need. Basically, you just watch Perseids, and press the “volume up” button when you see one. The app records the exact time that you saw each Perseid. In the morning, it automatically emails your data to our data-collecting email address, along with the longitude and latitude. If we can get enough people submitting data, we’ll be able to analyze it statistically for spatial patterns. Your help would be much appreciated! I think the comment about the bright waning gibbous moon in the last paragraph (When?) was intended for 2014. Thank you for your comments. At the time this article was written, the moon was at a waning gibbous phase. That statement was aimed for the first week of August. Now that we are entering the second week of August this statement has been omitted. Thanks Chris for the link. Very much appreciated. Hi, thanks for the detailed info! I’m wondering, can I see it from Saudi Arabia possibly? How would I figure out the time they’d be in the sky from this area if they are even viewable from here? No matter where you are located in the northern hemisphere, the Perseids can be seen most of the night. The later the better though as the radiant (the area of the sky the meteors seem to come from) lies low in the north at dusk and highest at dawn. All the quotes of high rates are for the late morning hours (4am) from rural locations. I am located in Panama. 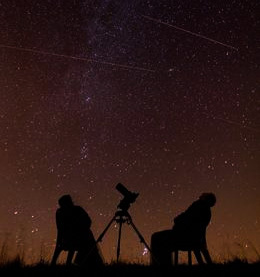 How visible will the Perseids be here? The maximum is now over but you can still see good Perseid activity from Panama and the rest of the northern hemisphere on Friday morning between midnight and dawn. I’ll be backpacking 08/15/15 in the Olympic mountains in Washington St USA… What is the best time to view the Perseid activity in this area? The Perseids are best seen during the morning hours when the radiant (the area of the sky the meteors seem to come from) lies higher in the sky. Since it will be 2 days past maximum activity, expect to see around 15 Perseids per hour. There are other minor showers also active plus random meteors which should provide another 15 meteors per hour. I can only imagine what people must have thought centuries ago when the perseids lit up the skies. Actually, I had no idea that the perseids would light up the skies on approx Aug 13. I was star gazing, enjoying the early morning peace and quiet, when, let me tell you, boy was I taken by surprise when the perseids lit up the sky. I saw the first one streak out of the corner of my eye and thought that maybe it was a comet like the spectacular brilliant blue one, that appeared from out of nowhere, that left me wondering did I really just see what I think I did. I intently watched the sky, not really expecting to see anything, and next thing, from every direction, up, down, one or two streaks through the sky began to multiply. There had to have been at least 50. All I kept saying to myself was that there has to be a rational explanation because I know I’m not seeing things. Although not as lively as the first morning during the predawn hours which only made the perseids more visible, they appear to still be active. To my delight, again, they are active as I type this and as the predawn hours approach, I understand they will more visible. After happening upon this site, I now know when I can get a good view of what truly is a sight that everyone should witness at least once in their lifetime. Thank you for having this site and again, I can only imagine what people must have thought centuries ago when caught off guard by the spectacular show, courtesy of the perseids. Although not as spectacular and jaw dropping as that brilliant blue comet streaking through the sky, the perseiids are no less awe inspiring as to what a spectacular universe we live in. And it’s free!